One year ago today I started a journey with no idea where it would take me. I just followed my guts and went ahead sharing my passion for bikes. Thousands of words, hundreds of pictures, 3 digital cameras, hundreds of contacts, over 230 000 hits and countless emails later, I am even more passionate about this endeavor. A little over a year ago I had no clue what a blog was. A fortunate discussion with my cousin brought me into this fantastic cyber adventure. I started on the 13th of July thinking that it was a sign. My Grandfather's lucky number was 13 and he made it through 4 years overseas during World War 2 in one piece. Thanks Grandpa, it's going well. People told me I was crazy to give this information away freely but I figured that it could help out some people and I would be doing a good thing. Turns out I was right. 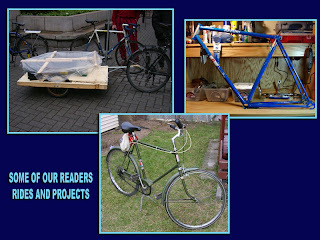 A man in China being able to commute to work because he can maintain his bike, a single Mom in England who, to the eyes of her son, became a Hero because she was able to fix his rear wheel, a guy who decided to bike again because he figured out how to fix his ride or a kid that decided not to give up and followed his desire to repaint his bike are just a few examples of the positive feedback I have received. These small events might seem like nothing, but they can have positive repercussions over a lifetime. Because of these small bites of information spread out there, somebody might be able to work and feed his family, have the admiration of a child for life, maybe avoid a heart attack or have the confidence to pursue whatever he/she wants. I am very aware of these possibilities. My day to day job has shown me that small events can have huge consequences in someones life. I feel privileged to be able to do this and I am very proud when ever I get an email telling me that this blog helped you out. To those who are here for the first time, welcome. Read, learn, get your hands dirty and don't ever quit. To those of you who have enjoyed this blog for a while, a thousand thank yous. Keep posted for more stuff, I'm not about to run out of things to write about and if you have a passion in life, share it with the world. You might make it a little better. I posted anonymously last year telling you that i was TRYING not to read your site because i was going to be obsessed about bikes again. Well, it didn't work. I've read every single one of your articles and i am once again obsessed with my bike. Your helpful articles has turned me into an amateur mechanic, as i am forever tinkering with my bike. Thank you SO MUCH! I'm having so much fun riding and working on my bike!! Congratulations Gerry. One year and counting. 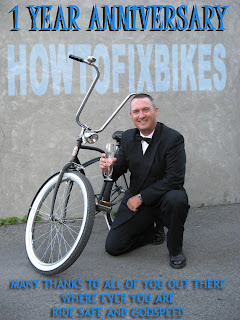 It's great to have on-line advice on bike maintenance that comes from a real person. Thank you all for your comments. I'm real happy I could help out. Make it many more years.....very interesting blog. Thanks man, hope to see you at the flea market in Lachute some time.